If you ever wonder why we’re in a crisis of leadership all you have to do is to watch and listen to those in positions of leadership. While there are clearly many aspects of leadership that must work together in harmony in order for leaders to be effective, everything breaks down when leaders don’t understand how to engage effectively. Let’s start with what leadership is not: Leadership is not a monologue, a speech, a lecture or a filibuster. Leadership is not talking at or over people. Leadership is not sequestered, does not live in a bubble or operate in a vacuum. Leadership is not exclusive or arrogant. Leadership is not about the leader. What we see all too often in today’s leaders are little more than egocentric talking heads. They are so enamored with seeing themselves on camera or listening to themselves talk they have forgotten it’s their job to solve problems not create or exacerbate them. History’s best examples of leaders are of those leaders who were/are highly engaged, very inclusive, deeply caring, and highly empathetic. They don’t fear being proven wrong, but are deathly afraid about the thought of being wrong and not knowing it. The best leaders are not interested in who is right, but what is right. They not only embrace dissenting opinions, but they seek them out at every opportunity. Real leaders are just as at ease when unlearning as they are when learning. And perhaps most importantly, they never pass up an opportunity discuss, converse, dialog, or debate. They know that their leadership is only as good as their ability to engage, listen, discern, and to act. Not about the platform: I’ve always said, but for the people there is no platform. You don’t lead a platform you lead people. It’s easy to spot real leaders – they focus on people not things. They understand without great talent and a vibrancy of culture even the best strategy will fail. Productive leaders understand platforms don’t solve problems, people do. Any leadership problem is a people problem at some level, and any leadership victory is a win for the people. As my friend Jim Kouzes says, “Love ‘em and lead ‘em. The art of and not or: The best leaders don’t fall into the trap of either/or thinking. The best leaders realize there’s rarely a good reason to juxtapose one option against another in a vacuum. This is simply a false paradigm created by intellectually dishonest rationalizations. The use of A/B frameworks as a decision making model unnecessarily limit opportunity by impeding creative thought and innovation. You will time and again observe the best leaders think and not either/or. The job of a leader is to create, expand and preserve options – not limit them. Ubiquity: I’ve often said the only place an army of one exists is in a movie. There is no doubt a good leader can accomplish much, but there’s also no doubt a culture of leadership can accomplish much more. Leadership that can’t be scaled isn’t really leadership. You can always spot great leaders because they don’t overshadow others –they elevate others. When in doubt, think ubiquity not scarcity. Leadership isn’t, or at least shouldn’t be, a scarce commodity. Far too many companies wrongly treat leadership as an esoteric role reserved for a privileged few. However healthy organizations realize leadership must be a ubiquitous quality that pervades every aspect of day-to-day operations. They understand every person must lead; even if people are only responsible for leading themselves, they must lead. Not tone Deaf: You’ll rarely come across successful leaders who have a tin ear. The best leaders are tuned in to the emotional needs of those whom they serve. They engage, they listen, they empathize, and they acknowledge. They treat you as a colleague not a subordinate. They seek to understand not direct. They are the not tone deaf – they are relevant because they show they care. 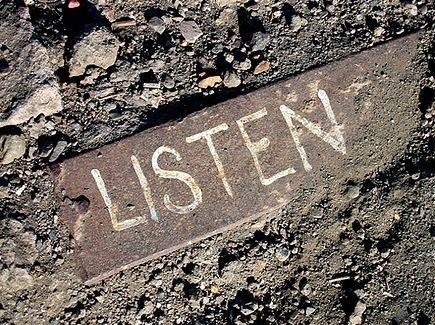 Anyone can add value to your world if you’re willing to listen. How many times have you dismissed someone because of his or her station or title when what you should have done was listen? Wisdom doesn’t just come from peers and those above you – it can come from anywhere at anytime, but only if you’re willing to listen. Expand your sphere of influence and learn from those with different perspectives and experiences – you’ll be glad you did. Understand Compromise: A my way or the highway attitude is not an attitude that serves leaders well. Choosing a side is not as important as understanding both sides in a way that finds common ground and brings people together by closing positional gaps. A leaders job is not to draw lines in the arbitrary lines in the sand, but to get people to step across lines and continue the journey. Remember this, compromise that doesn’t create forward movement is little more than useless gamesmanship. Real leaders understand they don’t have to compromise core values in order to reach a compromise. You’ll never see a great leader who is not highly skilled in the art of meaningful compromise that moves the needle. No paralysis: Leadership begins at the end of your comfort zone. It’s not hard to spot good leaders, as they’re the ones who not only live outside their comfort zone, but they inspire others to do the same. They encourage and empower others to challenge institutional thinking, dominant logic, and conventional practices. If your organization is always finding reasons to manage risk and not opportunity, to fear change rather than embrace it, or to rest on your past accomplishments rather than create new ones, your leadership may be suffering from the paralyzing effects of stasis. The best way to spot real leadership is to look at the scoreboard. As much as some don’t want to hear this, leadership without results is little more than a charade. Alignment: I’ve often said, managing expectations is gamesmanship, but aligning them is leadership. The best leaders inspire a one company, one agenda mindset. They don’t create internal competitors, but rather they focus on creating an ethos of internal collaboration. The best leaders are those who operationalize values, vision, mission and strategy – this only happens through an understanding an alignment of a shared purpose. No purpose = no passion = no leadership.